Have you ever wondered how the pets of interior designers, decorator's and those obsessed with home decor trends live? A typical designer's home is an expression of his or her style and the way their pets live is always stylishly incorporated into their designs. Not only are private pet zones created, furniture, and furnishings required are also planned to fit into the theme of the interior. After all, their pets also require their own nicely made-up space, just as yours does too. Pet lovers like you and I are very particular about the well-being and comfort of our cherished family member. We know their well-being isn't limited to a good healthy diet and regular visits to the vet. We almost always consider their comfort too, because of the warm personal attachment and deep affection we have for them. Cats and dogs are the most common pets you'll find in most pet lovers home. As they serve as just pets to some, they are regarded as children and family to others. From cats and Yorkshire terriers to the golden retriever and Great Dane, they all require a nice and comfortable place to relax or sleep, just as we all do. Here, you will find some favourite pet beds many interior designers and the house-proud provide their pets. From simple floor cushions to a play/sleep item, you'll find that if you desire a stylish and aesthetically pleasing interior for your household, make sure your pet's space fits well into the theme of your home decor. 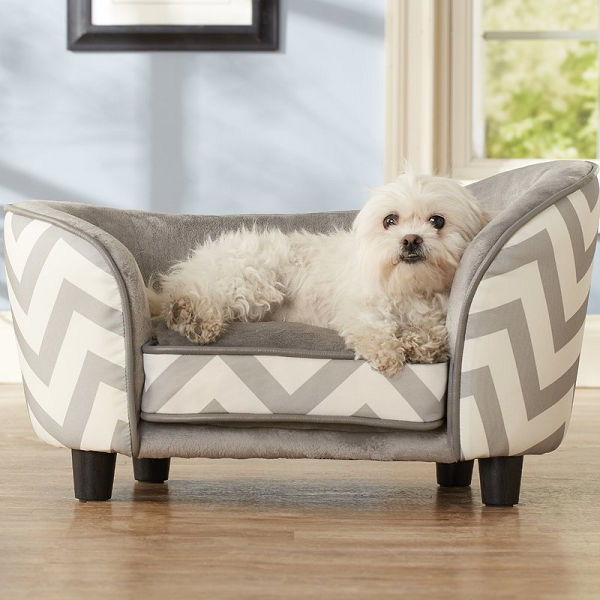 Chevron Snuggle Pet Bed - A stylish and comfy pet bed with a storage area for 'bones', chews, and other pet toys. 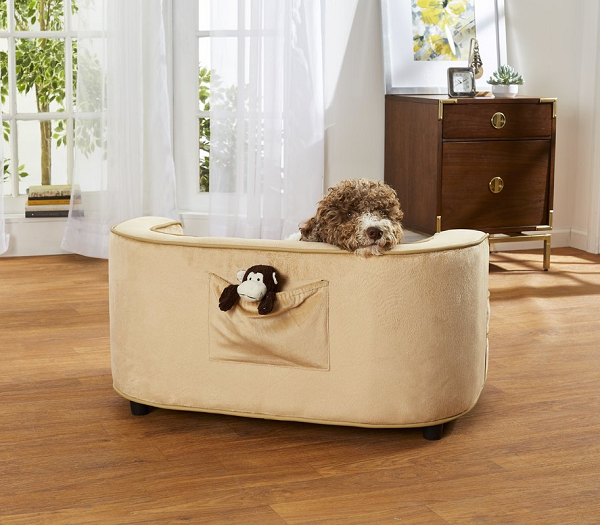 The snuggle pet bed is great for both cats and up to 10lb dogs. It is so ultra plush, it will fit well into any modern home. One good advantage - it has a removable cushion which you can clean when necessary. A dual function pet furniture that will not warp, crack, or split. It also resists moisture and is maintenance free. Serves as an end table as well. 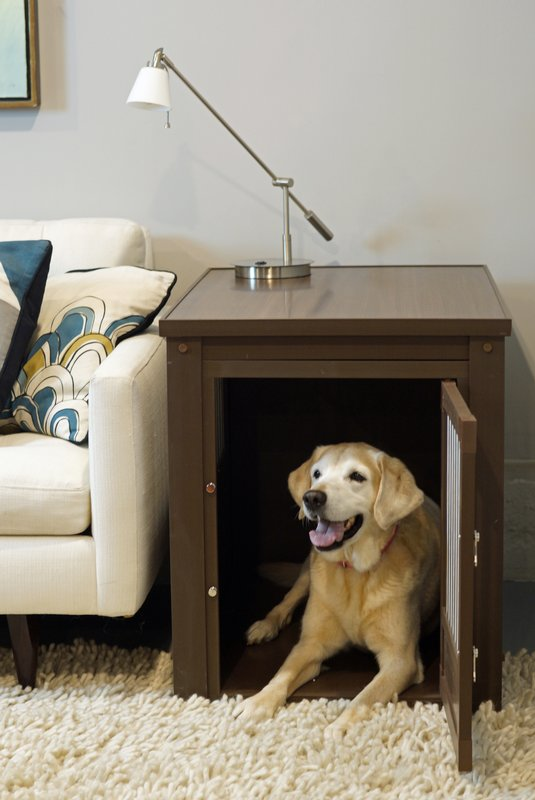 This modern piece, the Pet Crate End Table, is a multi-purpose pet and human furniture item. It works as an end table as well as a cosy crate for a pet. Its door has stainless steel spindles and it includes a front latch. I saw this in a fellow interior designer's small home and fell in love with it. It can be painted to coordinate with other interior furnishings. This elegant and trendy cat lounge offers your cat both the ease of scratching and the smooth comfort of lounging, all in one. The Ultimate Cat Lounge and Bed is also a cat scratcher. 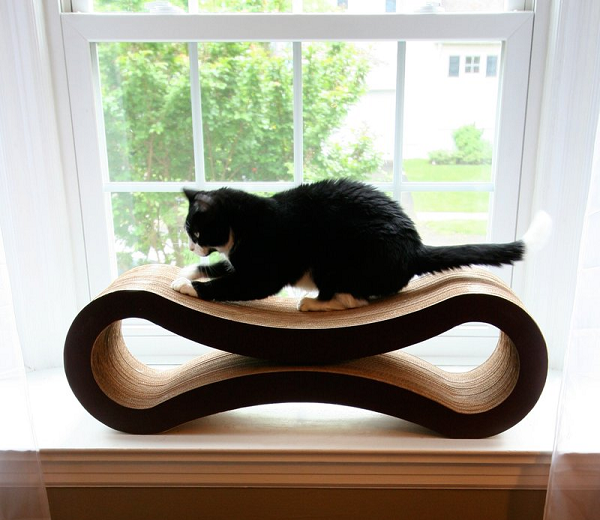 Your pet will love this sleek furniture, just as well as you will because it is actually a decorative piece as well. It has a trendy and sophisticated design that will complement any modern style home decor. Elegant cat furniture is intended for smaller cats. It will fit into most decor themes and you can also choose a colour that 'll complement your home decor. 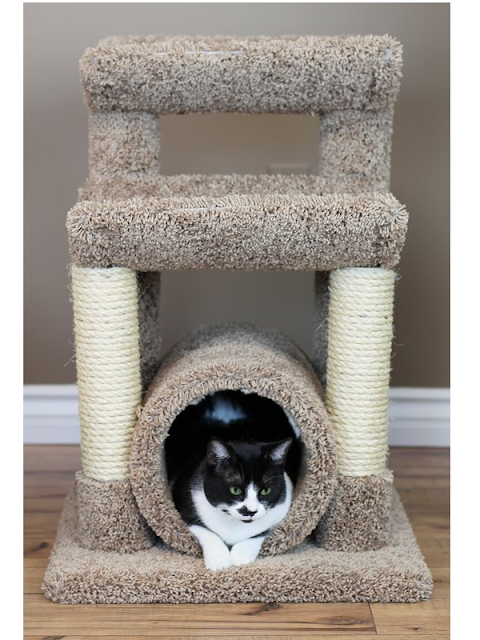 This chic Cat Scratch Post and Sleep pet furniture is perfect for the scratching and sleeping needs of cats. It is stable (tough wood skeleton) and highly durable, and the 'scratching' material is sisal and it is covered in soft and plush carpet. 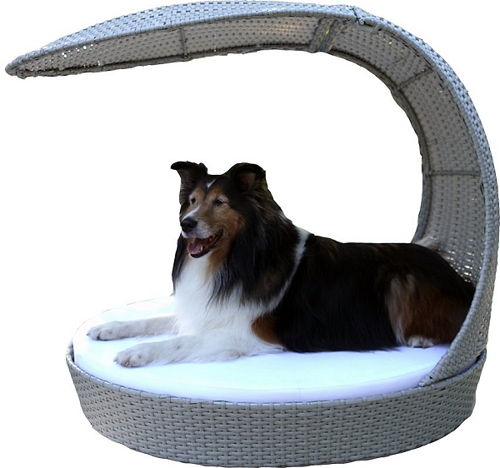 You and your family can enjoy a relaxing time in the sun while your dog relaxes in a cool shade, lying on a stylish bed constructed of durable waterproof poly rattan. You must agree with me that this outdoor hooded dog chaise lounge is an aesthetically pleasing chaise for your dog to use outdoors on the porch, on a deck, by the poolside, or in the garden. 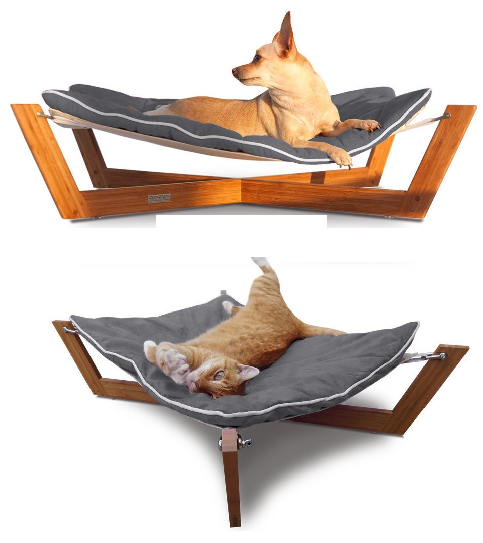 This hammock style bed combines clean lines with a unique sleeping surface and is one of most sought-after designs of pet furniture. The Bambu Cross Pet Hammock has a unique comfortable surface that responds to a pet's body weight. This quality helps to relieve many of the pressure points that create discomfort and often lead to arthritis in dogs and cats. An ultra-posh dog furniture with a storage compartment to hold doggie fun toys. It is raised from the floor and has a removable seat. Easy to clean piece. This large-sized ultra plush dog sofa comes in beige and grey colours. It's perfect for a set up in your pet zone and will compliment your interior brilliantly. It will work well in both contemporary and traditional settings. It's a good size for both small and medium-sized dogs, up to 50lbs. If you own a pet, you can show off your personal style by carefully creating pet home zone that blends perfectly with your style of living. Let your pets understand that this item of furniture is theirs and this particular space or zone is theirs to relax, play, or sleep in. And remember, if you are looking for a great gift idea for your pet(s), pet furniture is a wonderful one.